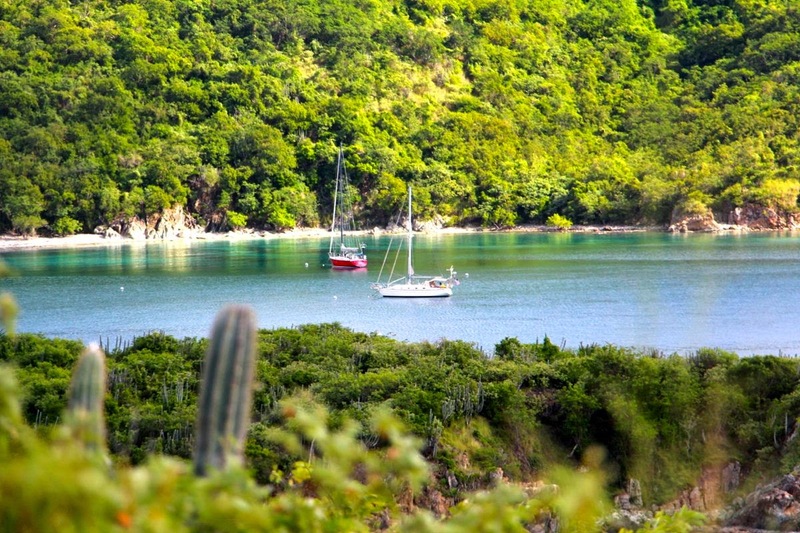 Lameshur Bay, St. John with Aspen resting in the beautiful setting. 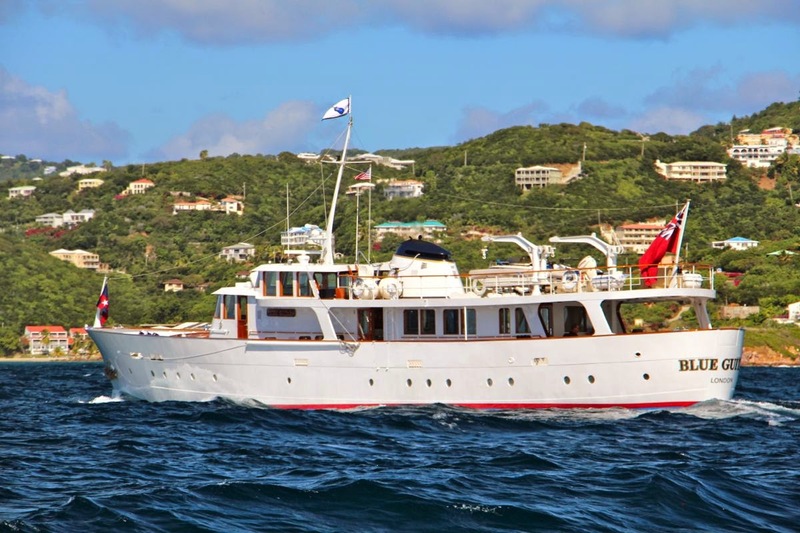 On our way to St. Thomas a nice motor vessel named Blue Guitar with Eric Clapton onboard slowly passed Aspen. Eric returned our waves but didn't invite us over for Happy Hour! 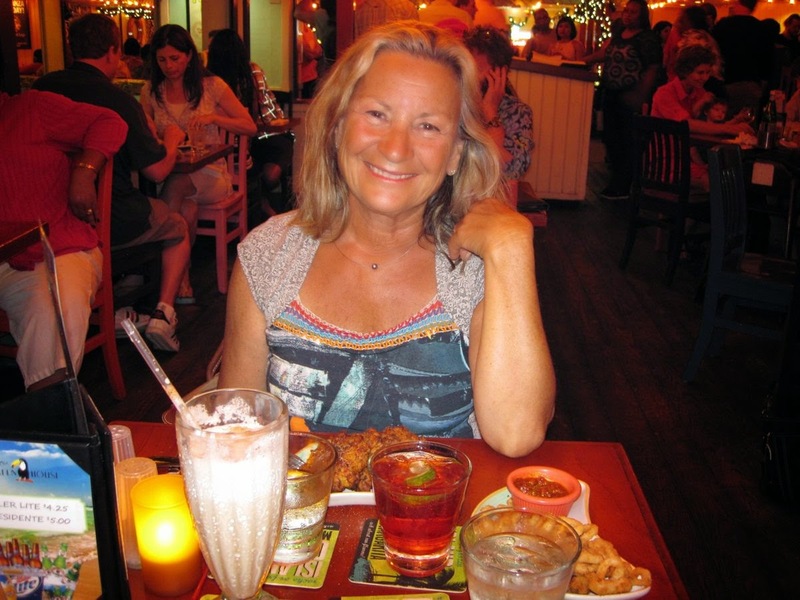 Dinner at the Greenhouse at Charlotte Amalie, St. Thomas before the parade of lights along the waterfront. 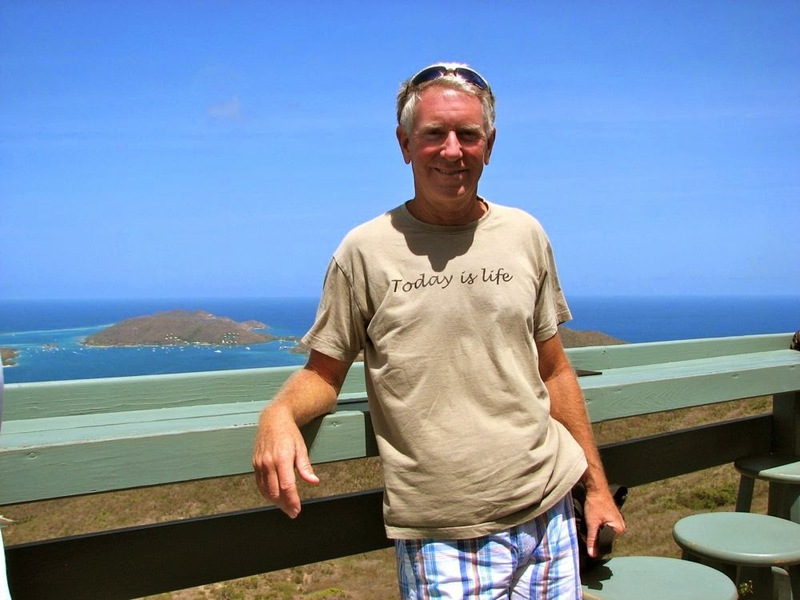 Captain Steve sailing in calm water once again in the British Virgin Islands. 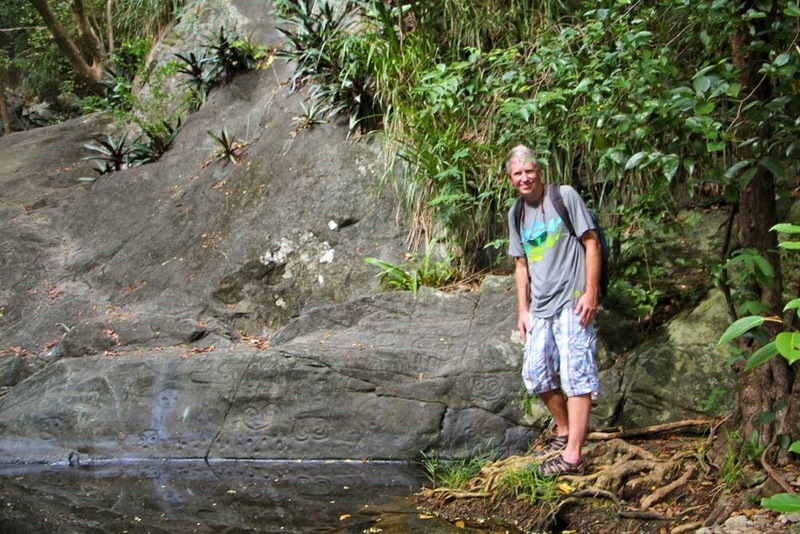 The small pool of water at the base of the waterfall near the petroglyphs. This is a really enchanting place that I love to run to every morning when we are nearby. 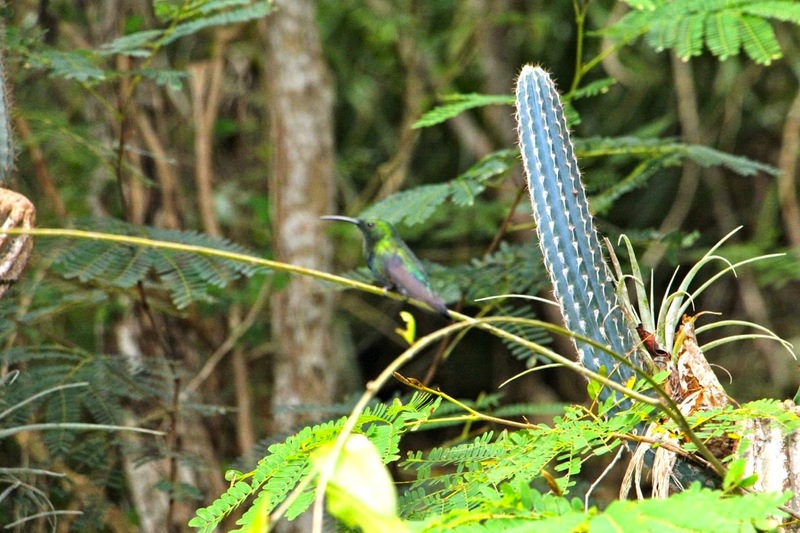 A nice luminescent bird on St. John. I have no idea what it is called. Now if it were a rock I might be able to name it! 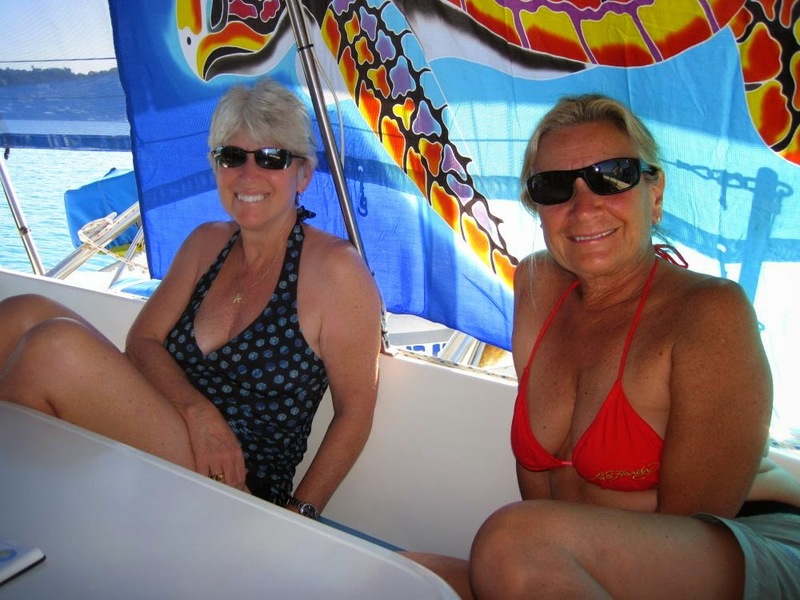 Dawn from the catamaran Cat Tales (from Canada) and Maria enjoying the warm Caribbean weather! 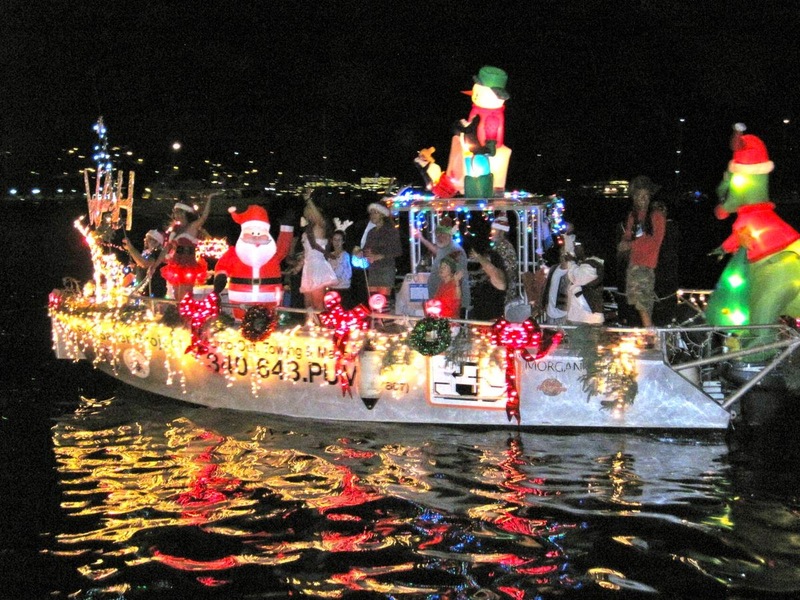 The St. Thomas, USVI parade of lights. 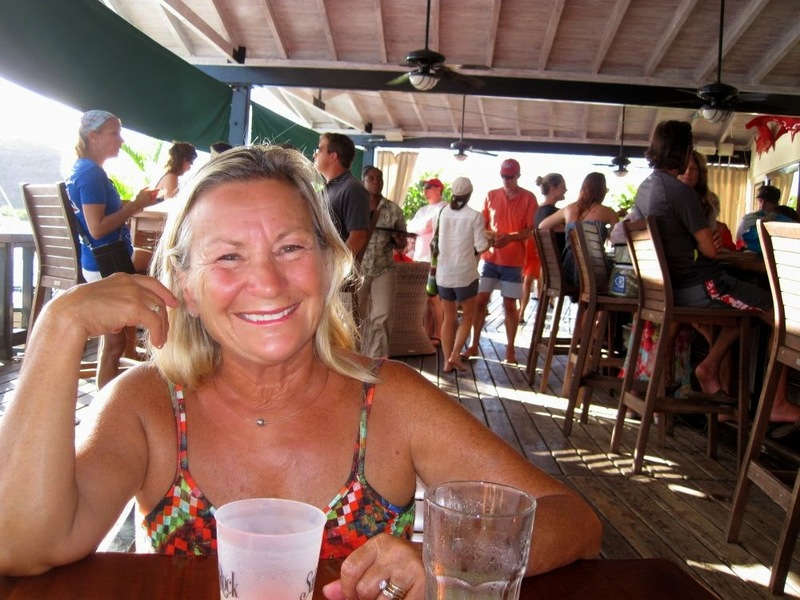 The waterfront at Charlotte Amalie, St. Thomas, USVI was alive with activity this fun night! The Winter Solstice. 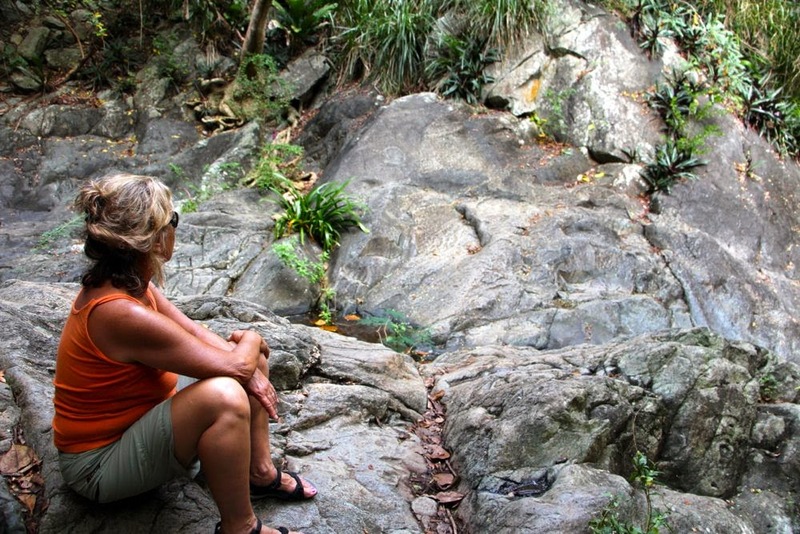 Maria and I are sitting at the base of an ancient waterfall staring intently at Taino petroglyphs on St. John, USVI. The Solstice: a time to watch the sun creep slowly northward again and the promise of longer days during the coming months. The long dark days of winter in the Northern Hemisphere seem lost to us floating on Aspen in the brilliant blue Caribbean Sea, so far away from home. Instead we are sunburned and haven't seen a snowflake fall from the eternal blue sky, at least not lately. 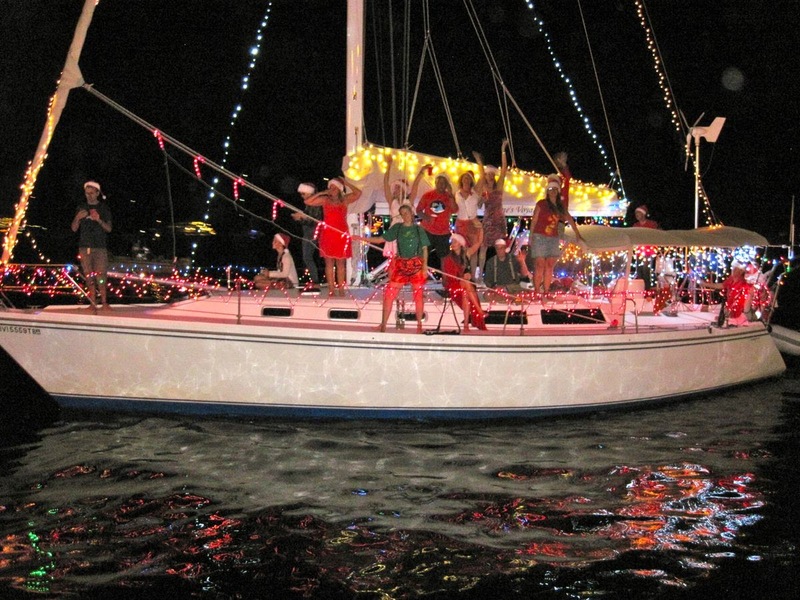 Ah, Christmas in the Caribbean, it doesn't get much better than this? Well, it does get better because Zach, Heidi, Nik and Timothy are flying down to stay with us for the big holiday. Nik and Tim will enjoy swimming before breakfast and late into the evening hours, as long as they don't recognize a few curious barracuda swimming under Aspen's keel. Hmmm, I want to see that. Merry Christmas and Happy New Year to all of our friends. The days are growing shorter and winter is upon us in cold Colorado. It must be time to go sailing in the tropics again. Before we leave for those little latitudes we want to announce that the book about our circumnavigation is finally finished! 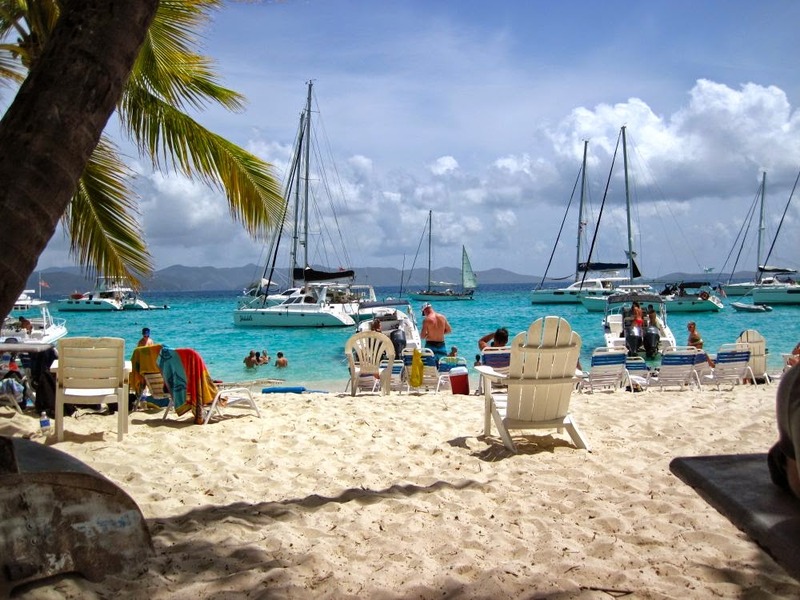 Enjoying a tropical martini in the BVI's! Then it was back to Colorado and guess what? SNOW!!! Our sailing friends on Cattales. The Pain Killer drinks at the Soggy Dollar Bar were awesome, arrrrr! We had to decompress here after working on Aspen in the boat yard! Aspen getting a well deserved rest! 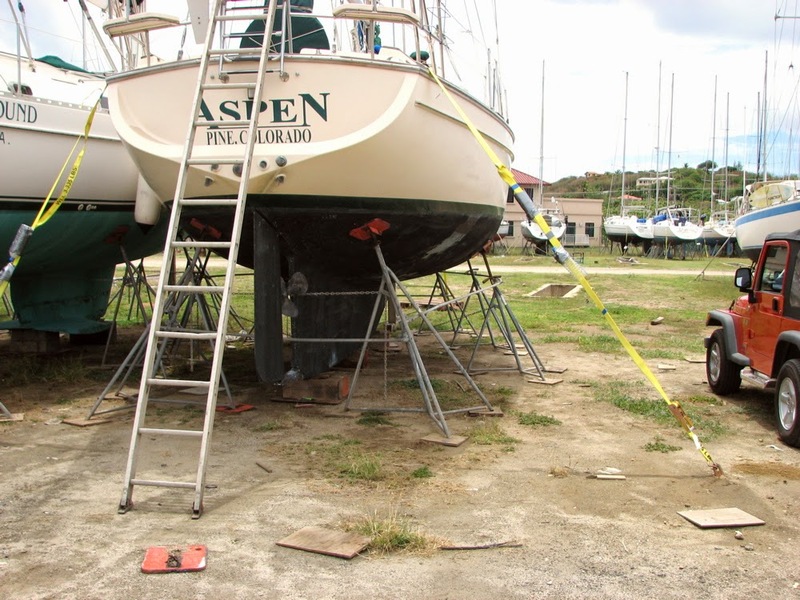 It has been a long sailing season for Aspen and her crew! 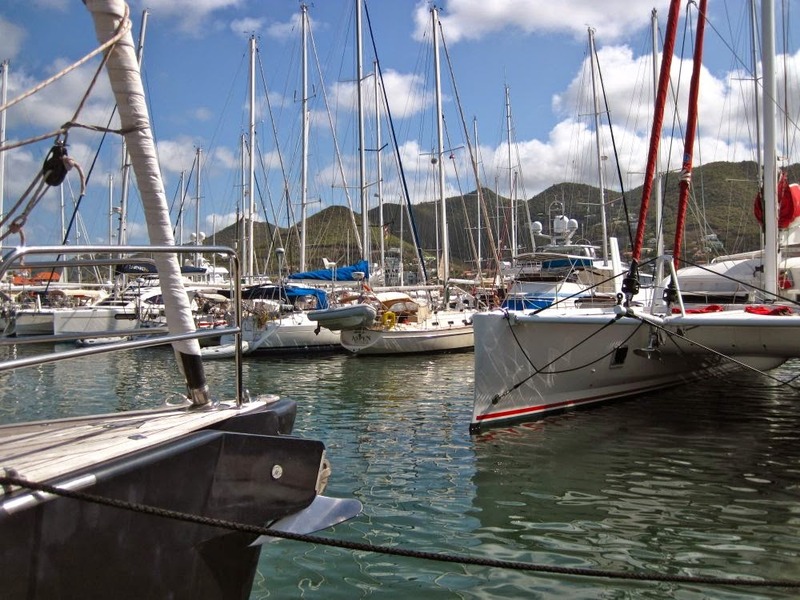 This season we started in Marmaris, Turkey and sailed across the entire Mediterranean, into the Atlantic Ocean and down to the Canary Islands where we joined the ARC fleet and sailed across the Atlantic Ocean to the lovely Caribbean to close our track around the world. 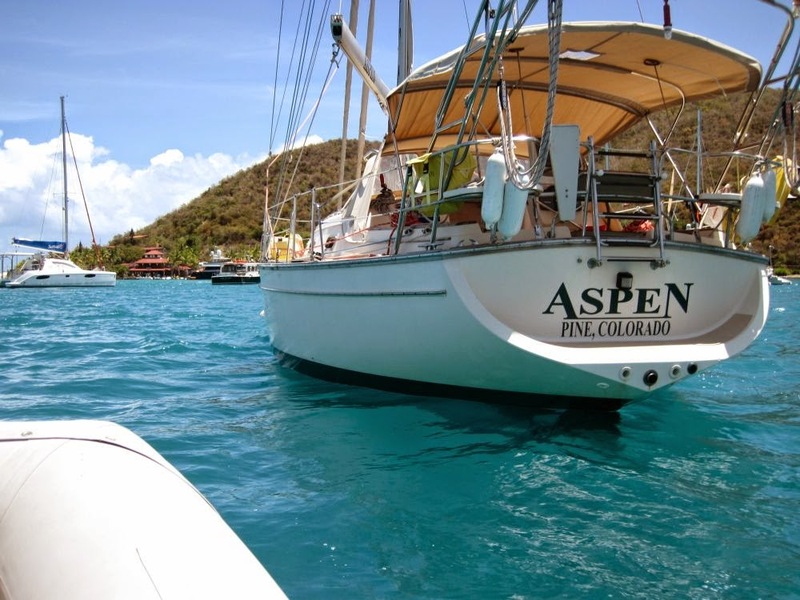 Then it was Island Time again as we made our way slowly up the island chain to the British Virgin Islands where Aspen is getting a much needed rest, as are her crew! 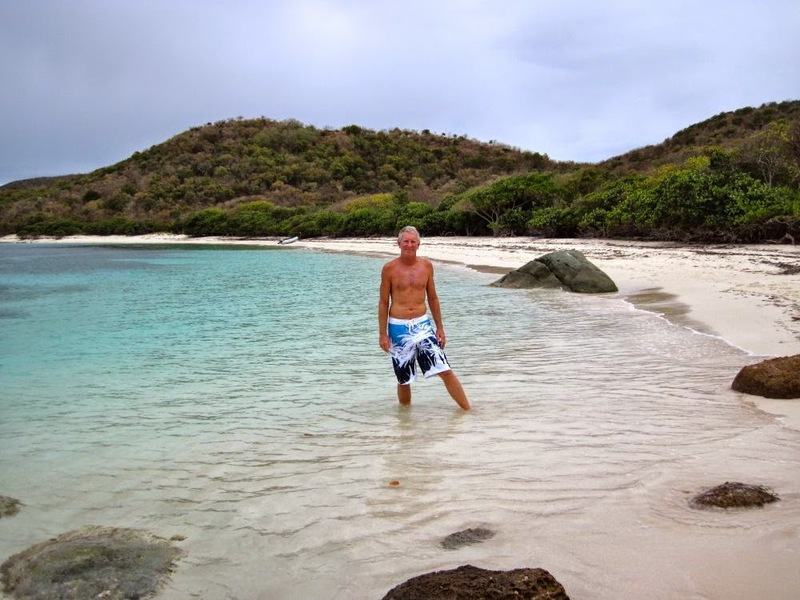 We spent a lot of time on Virgin Gorda in the British Islands, one of or favorite places. It was also fun to sail along with our friends on Cattales and enjoy the warm weather and their knowledge of the islands once again. 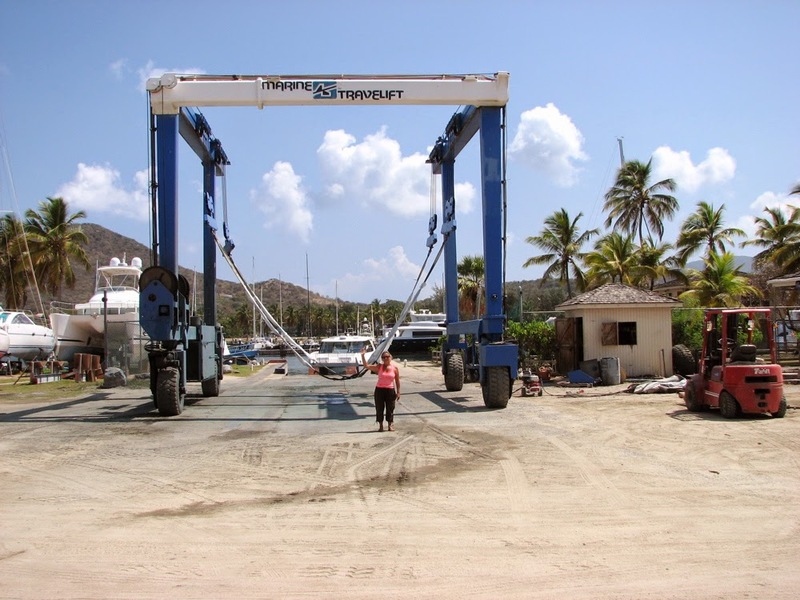 We spent many an evening in and around the boat yard with Cattales and toured Virgin Gorda in a rental jeep where we found some great places to eat (and drink of course). So until later we wish Aspen a safe hurricane season and for her crew, a fun and enjoyable time in our home in Colorful Colorado! Even more umbrellas for the tourists on Orient Beach! Aspen's broken part. I thought you wanted to see what we were waiting for! It is the black plastic piece on the right side that decided to break. Luckily it wasn't the steering that is on the lower left side! The critical part for Aspen finally arrived! 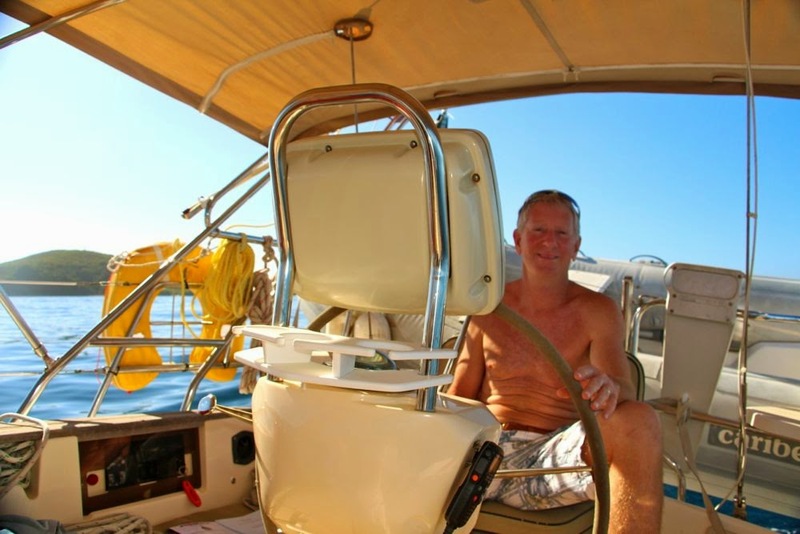 Captain Steve managed to install it as well so we are now ready to head further north to the BVI's. Well, as soon as the weather cooperates of course. 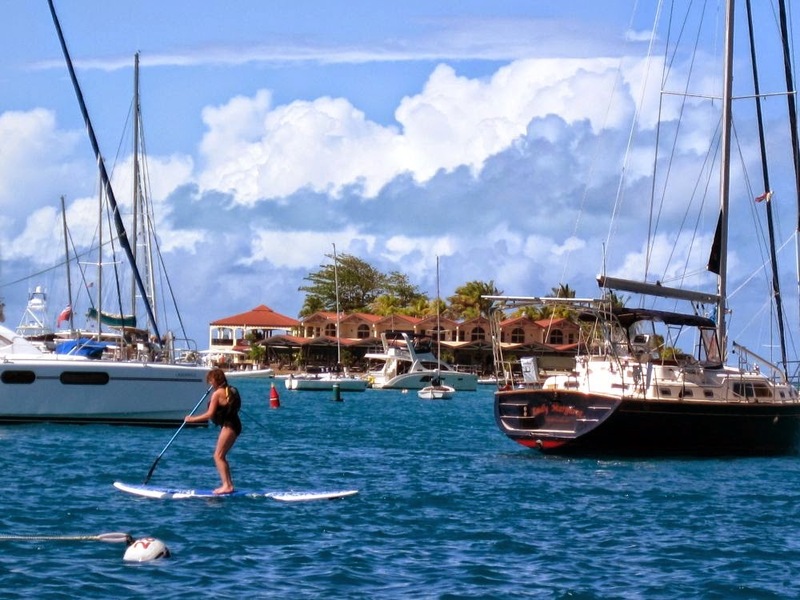 Based on the GRIB files, Monday looks like a good time to sail across the dreaded Anegada Passage to visit Aspen's home for the coming hurricane season. 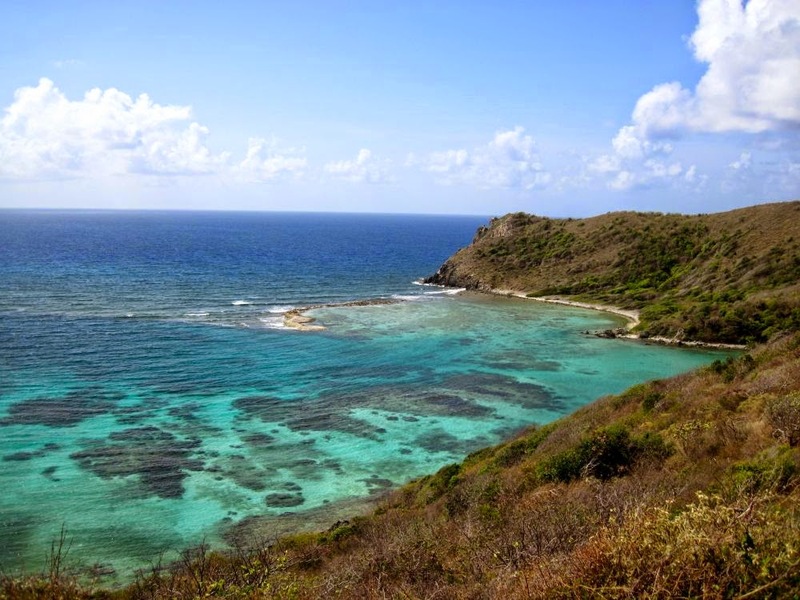 Of course the GRIB files are usually wrong but at least they give us a good reason to leave Sint Maarten and the great time we have had here. 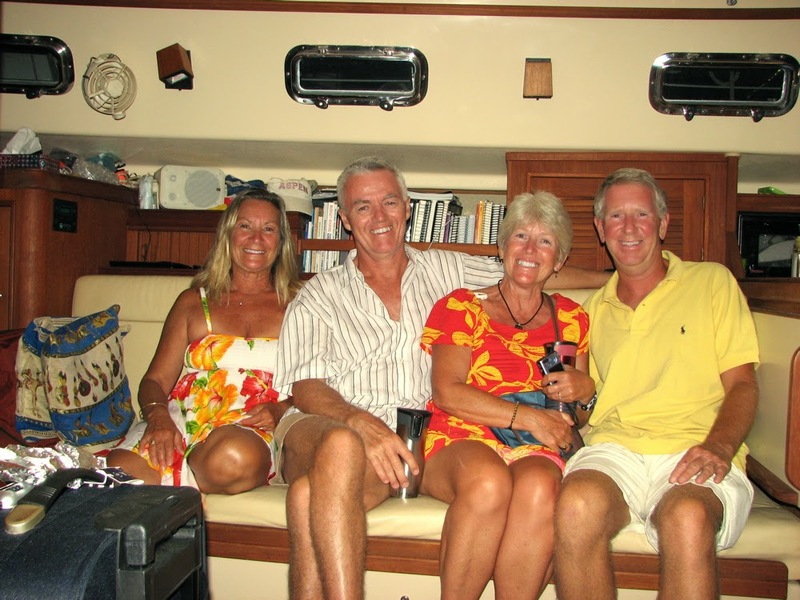 Connecting with sailor friends from 5 years ago on Sint Maarten was fun and it seems that they have aged a little, but not us of course! 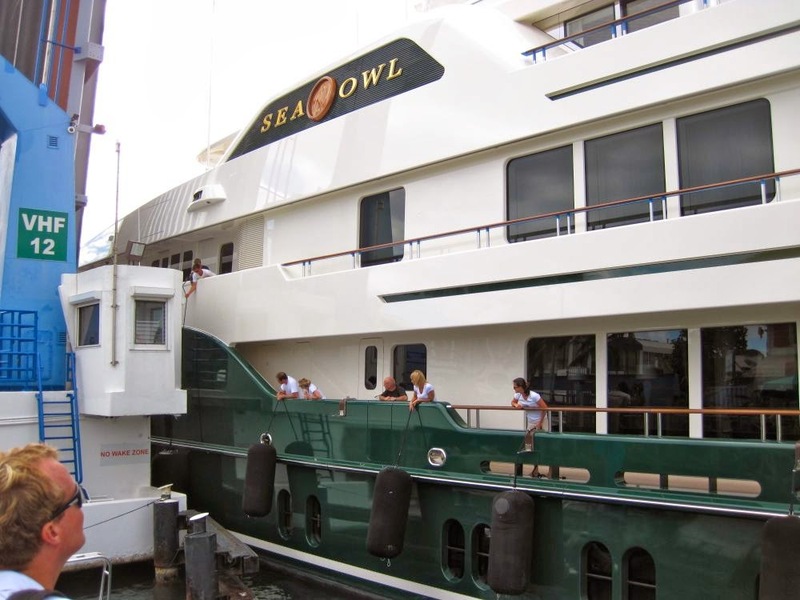 Even though no one recognized us at first, until Maria always remembered their names and their boat names, a spark of recognition finally happened much to everyone's delight. 5. 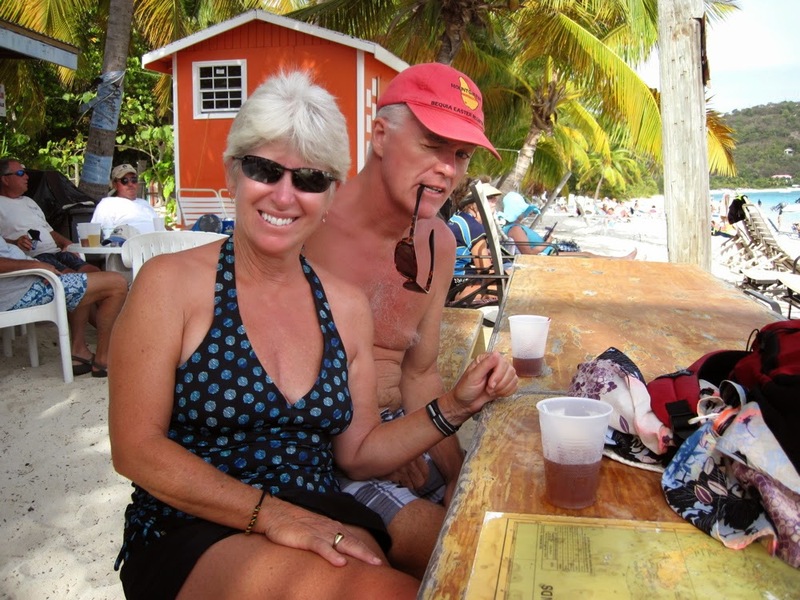 Andy and Cheryl's on Orient Beach - Everything! Now that we have been here for over one month, also making repairs to Aspen and spending lots of money at the convenient chandleries that are well stocked with boat parts, we are finally ready to leave. I casually mentioned to Maria that since we have a full fuel tank, extra fuel in our jerry cans, and probably enough food to last 6 months maybe we should just head west and visit Panama and the Pacific again instead of going north to the BVI's . I can't really write her reply in this G rated blog! 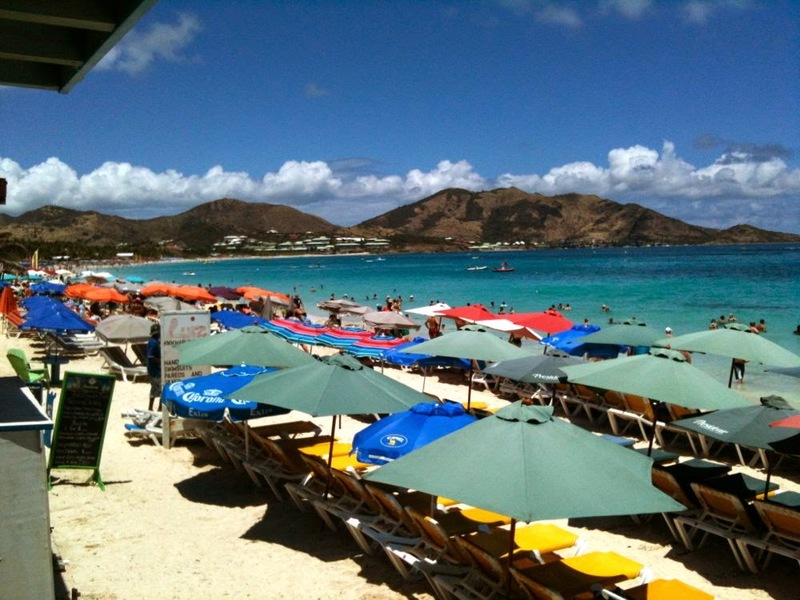 It has not been boring here on Sint Maarten/St. Martin, that is for sure. 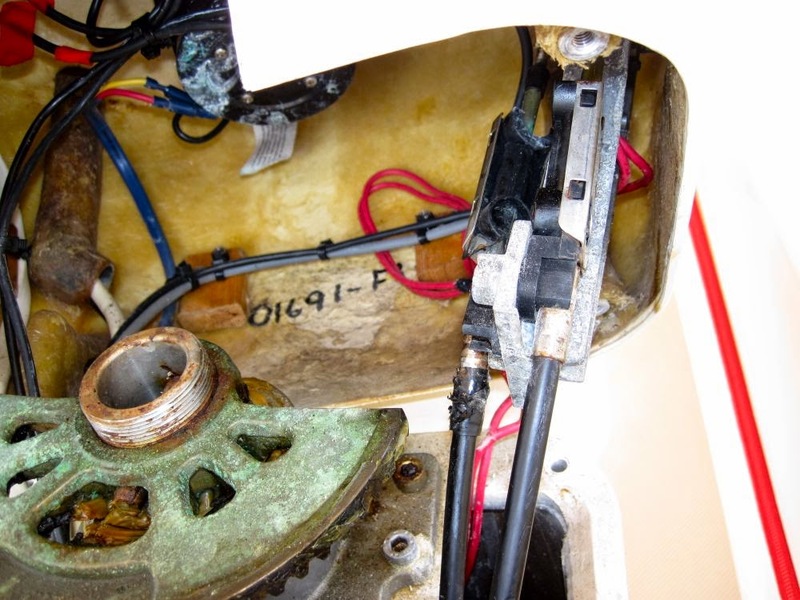 Luckily we are still in the marina with electricity and easy access to land, especially since we still don't have our part to repair reverse gear on our main engine! Actually we did receive a part but of course it was not the right part. Geeze. 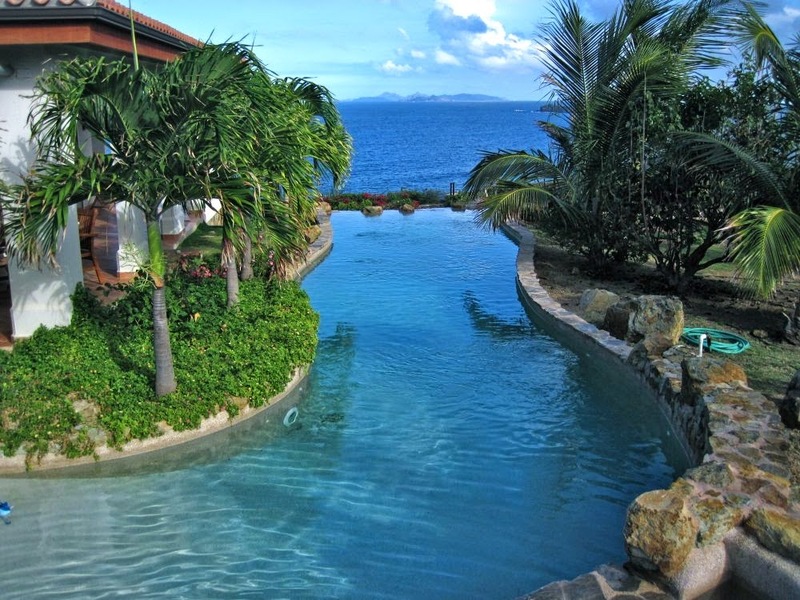 So we hustled around the many places here on the island and Island Water World located the correct part for us. Now all we have to do is get the part down here to us! Let's see, I ran a half marathon, around the entire Simpson Bay Lagoon and didn't die of heat stroke. I thought that was an accomplishment. I forgot how competitive the French and Dutch runners are down here so I was lucky enough not to finish last. I won the Veteran age group but they didn't give awards for that. 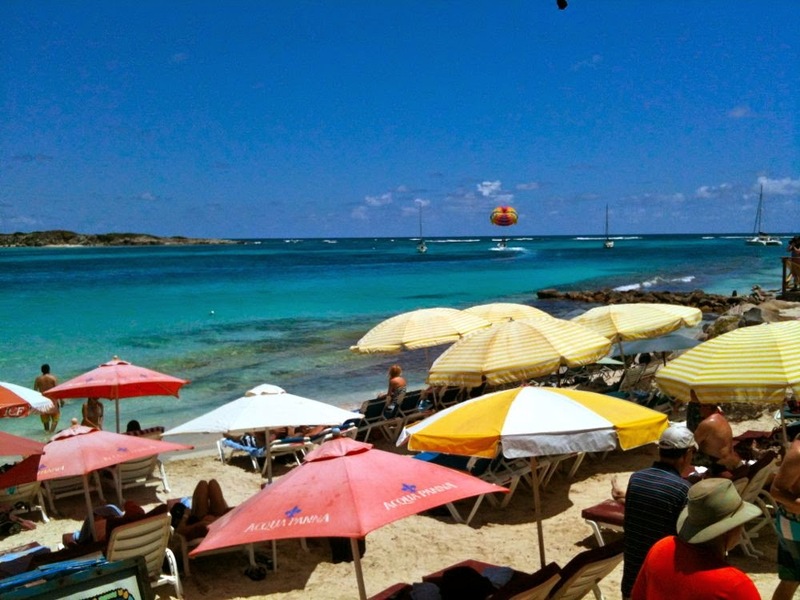 We have been going to the many beaches around the island and enjoying the beach bars/restaurants and people watching of course. The water temperature is a little cooler than bath water but not by much so sitting in the water is really nice and relaxing. We ran into our Dutch friends that we have not seen since we lived here in 1997. Wow, what a nice surprise that was! 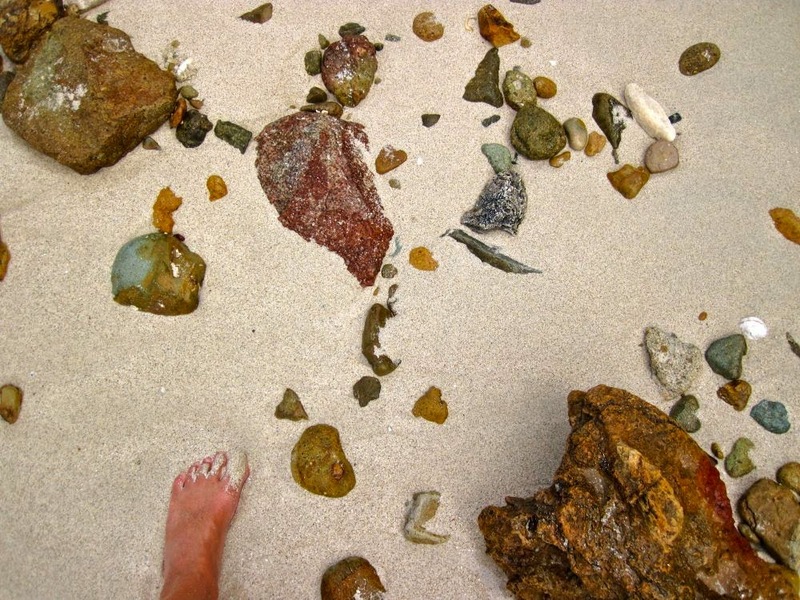 I ran many many miles with them so long ago on the roads around the island. They remembered Maria and I as if we had never left. Good friends never forget, it seems. Other Mainer friends (look that one up!) 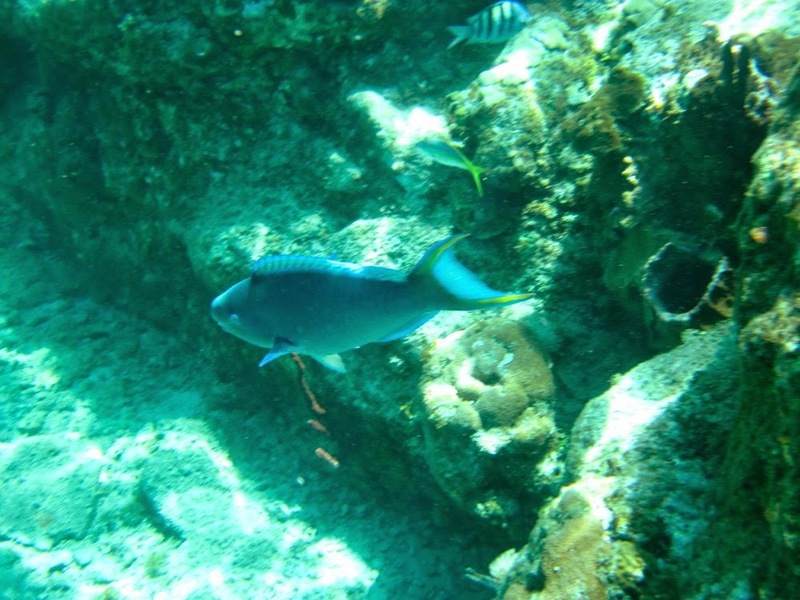 also visited the island for 2 weeks so we caught up with them as well, on the beach of course. It has been a long winter in the northeast, they explained, and they didn't want to go back. We just smiled and bought them a drink. 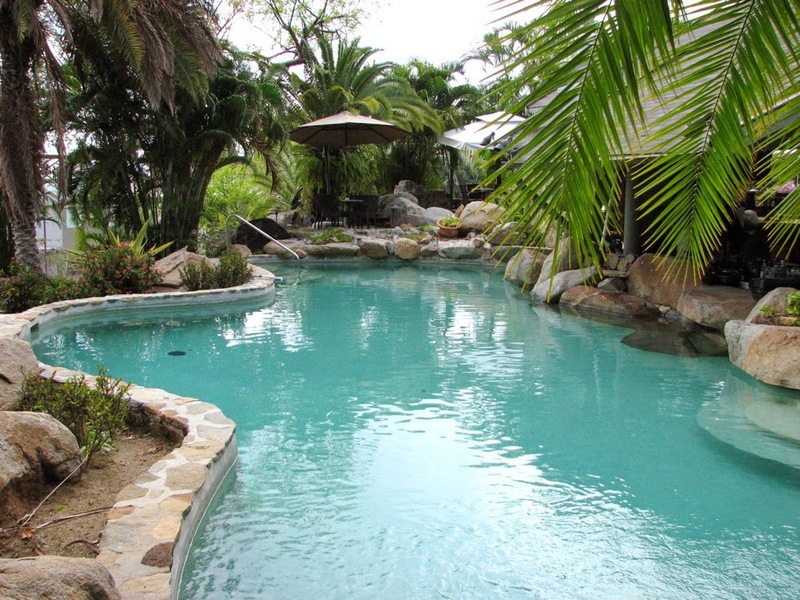 Another couple that we knew from 2006 built a villa on the Dutch side of the island and invited us to visit and enjoy their pool and view. Wow! 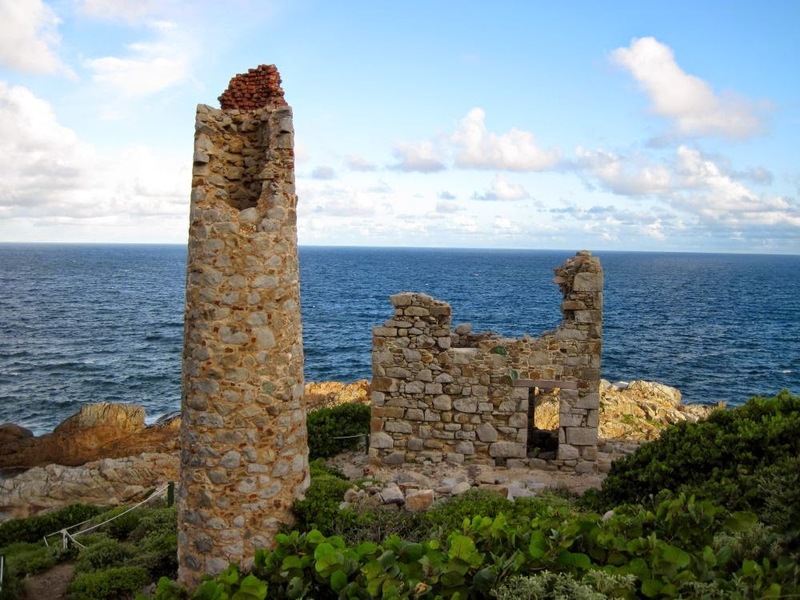 You can see by the picture that it is spectacular and great to visit with them while looking at St. Barths in the distance and sipping rum punches. 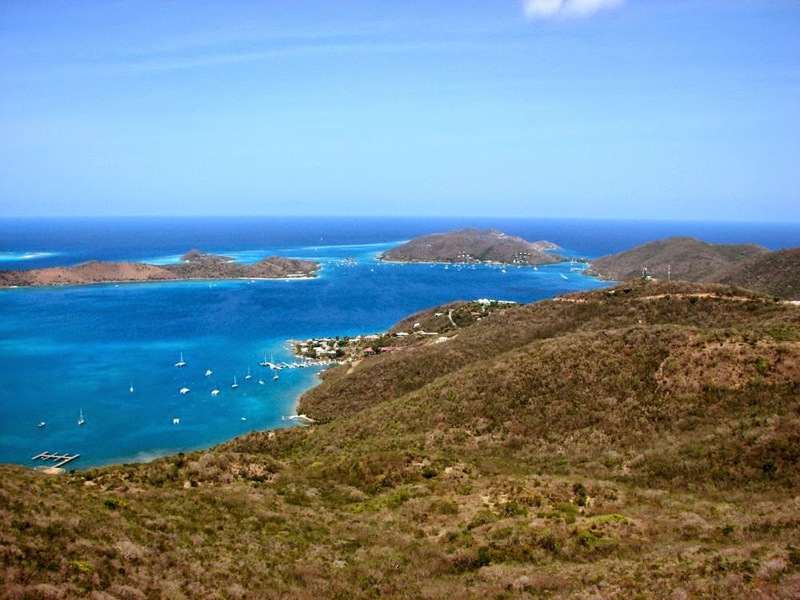 Once I get Aspen working again we will sail further north to the BVI's and more fun times there. 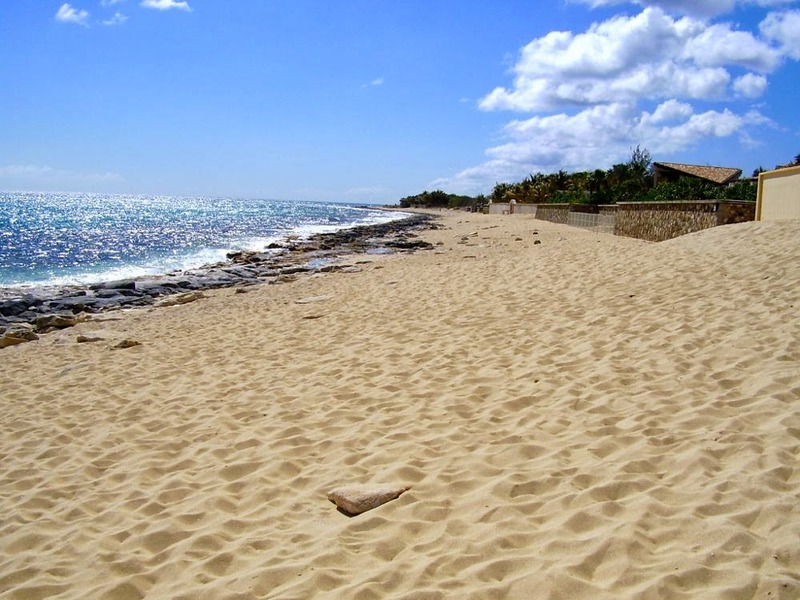 A Typical Antigua Beach. 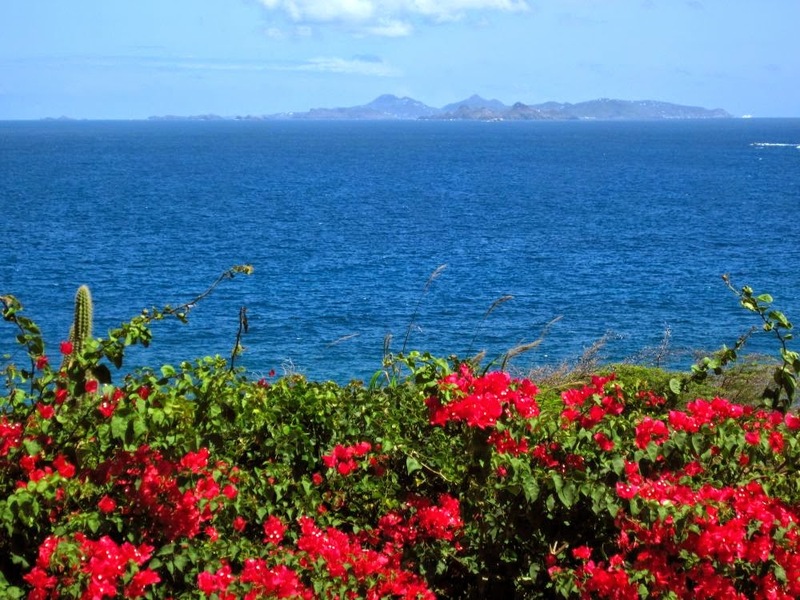 Do you see Montserrat in the background? It has the puffy smoke from the volcano billowing out! One of the nice mega-yachts waiting for the owner to arrive. St. Martin beach bar restaurant Andy and Cheryl's. 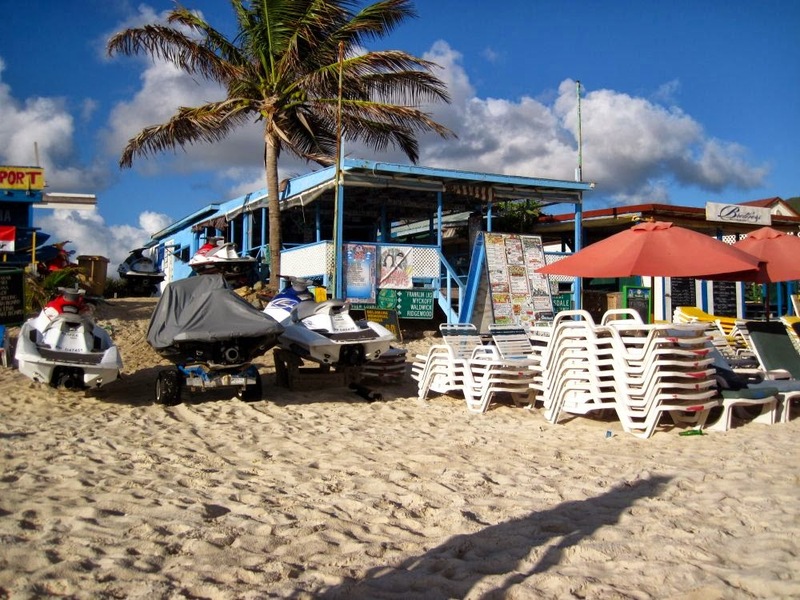 It used to be called Baywatch and it is located on Orient Beach, the most popular beach in the Caribbean! 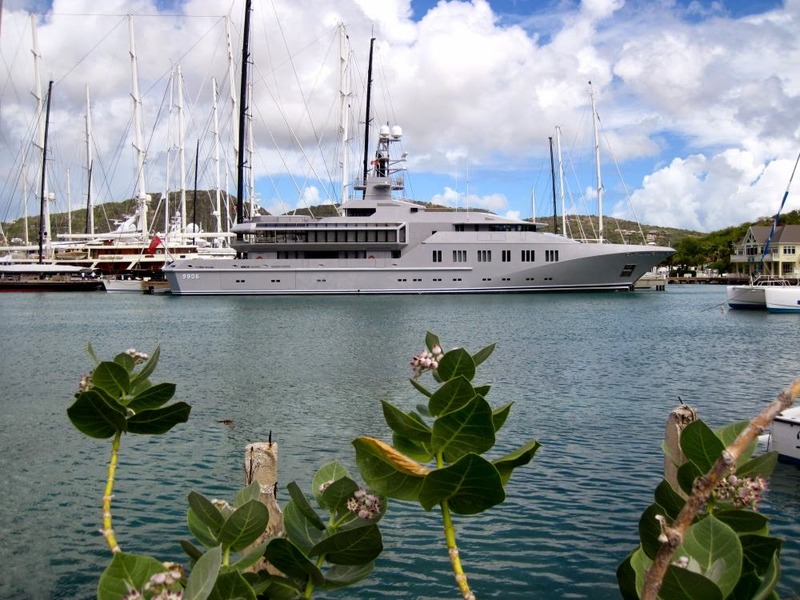 One of the mega-yachts trying to squeeze through the bridge on the Dutch side of Sint Maarten. Notice the fenders that will touch the side of the bridge! Whew, it made it through!!! 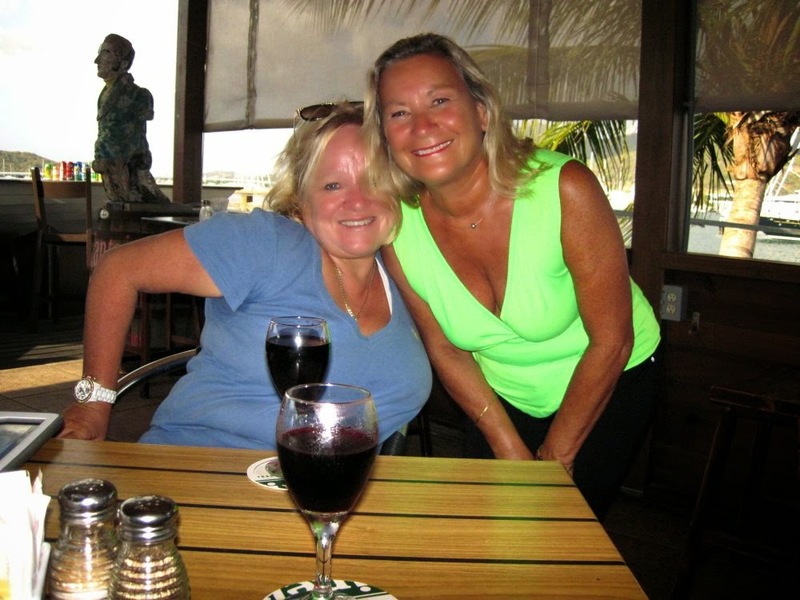 Happy Hour at the Sint Maarten Yacht Club with friends. 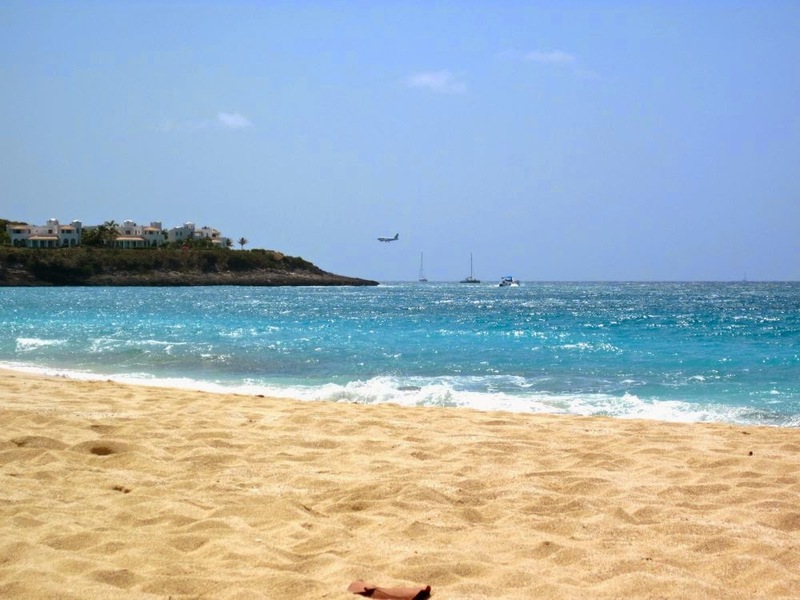 A typical beach on St. Martin! How time flies out at sea. 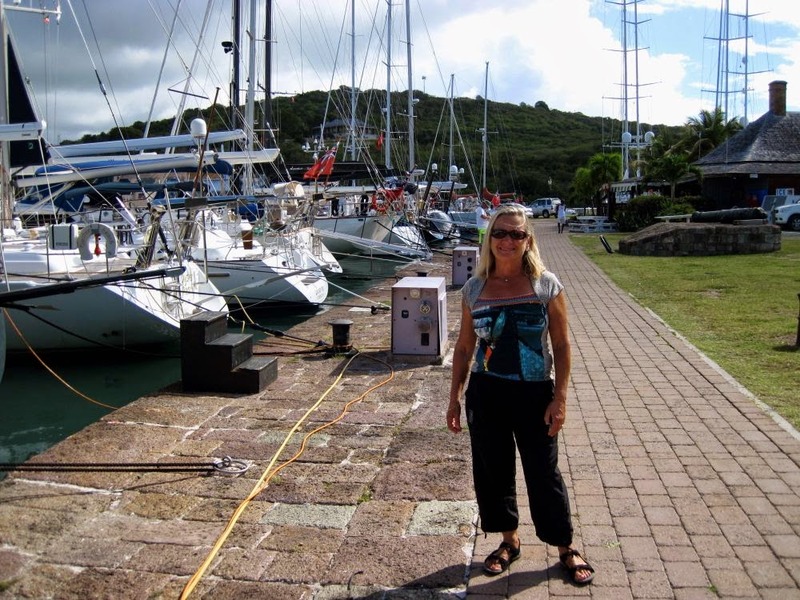 We left tropical Dominica and sailed to Guadeloupe, further north in the Leeward Islands. We were in France once again with wine and cheeses to satisfy our hunger. The anchorage at Deshais was overcrowded and during the night there were 40 knot winds that raked the small bay. 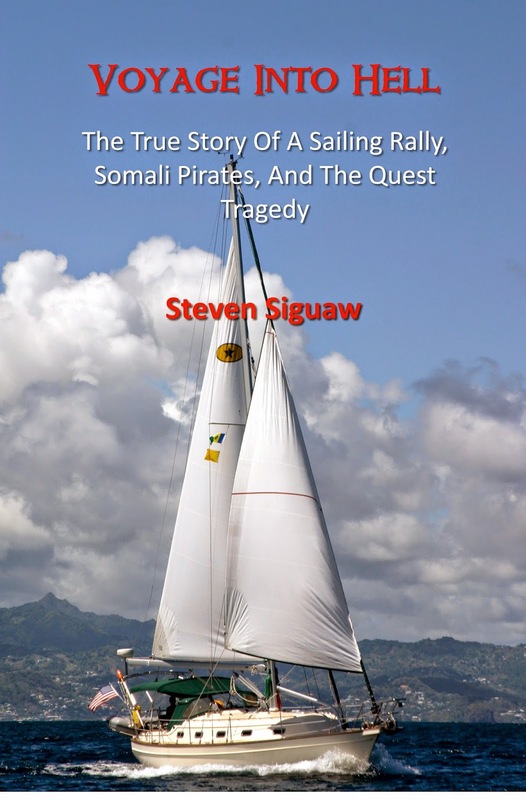 Many many boats dragged with even a dinghy with its' attached engine flying into the air at midnight. Aspen's anchor held easily but boats were whisking past us at warp speed and out into deep water every few minutes. 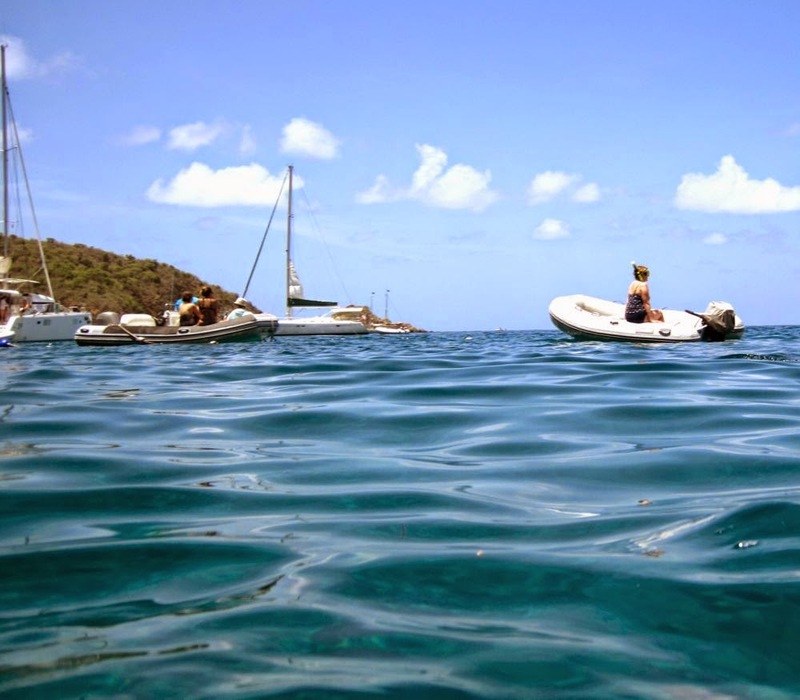 With little sleep that night we decided we had enough of bumper boats so we sailed to Antigua and some shelter from the mayhem. 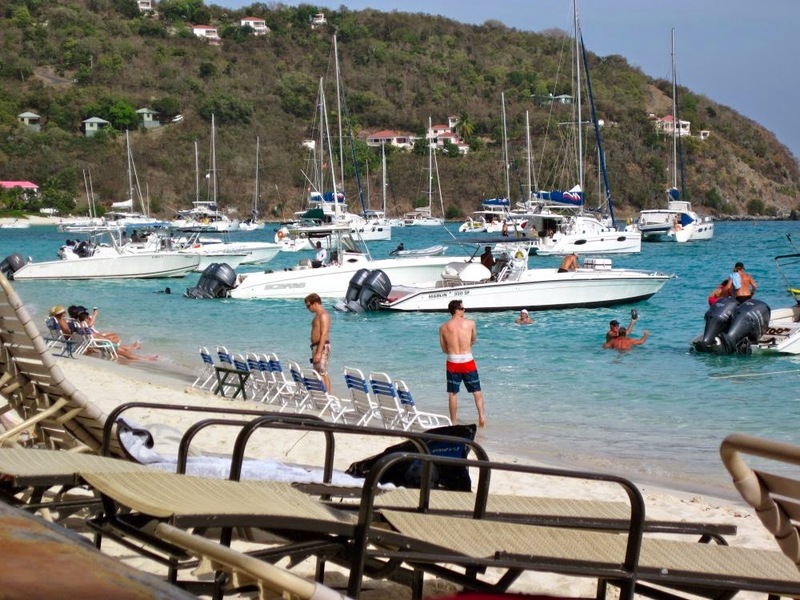 Jolly Harbour in Antigua was just what we needed! 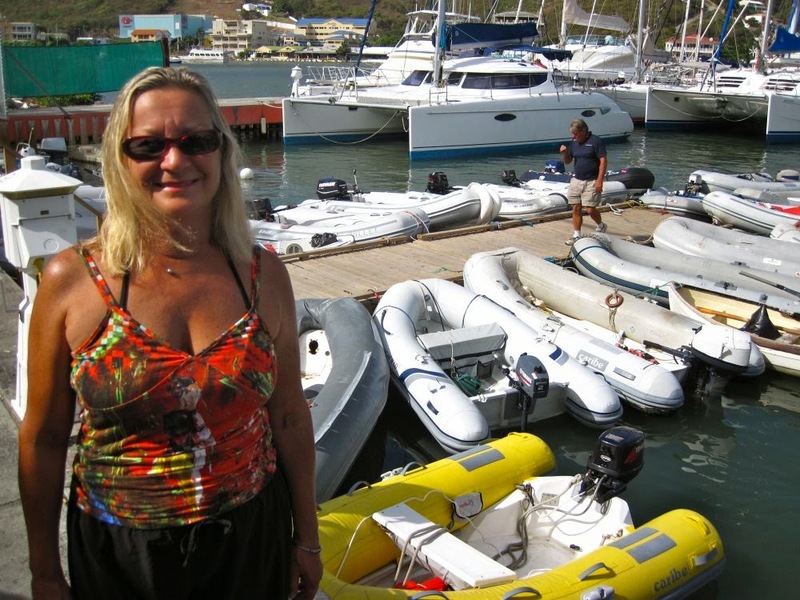 A secure marina, friendly customs people and smiling local people to welcome us. 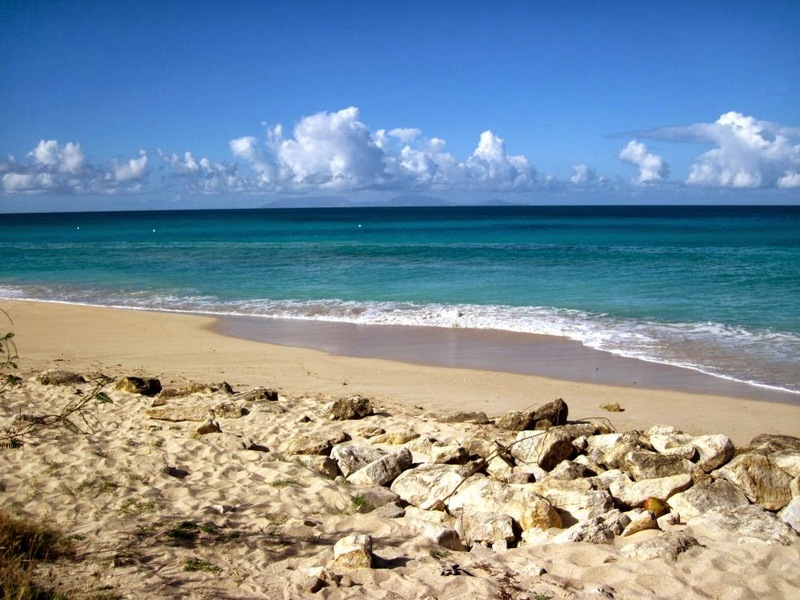 Did I mention that the west coast of Antigua has spectacular beaches as well? 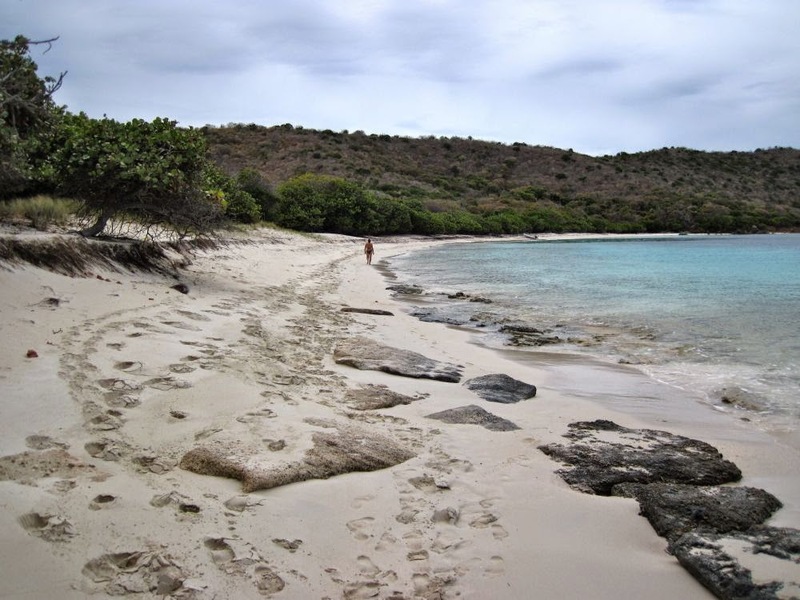 They are really uncrowded and worth the visit. 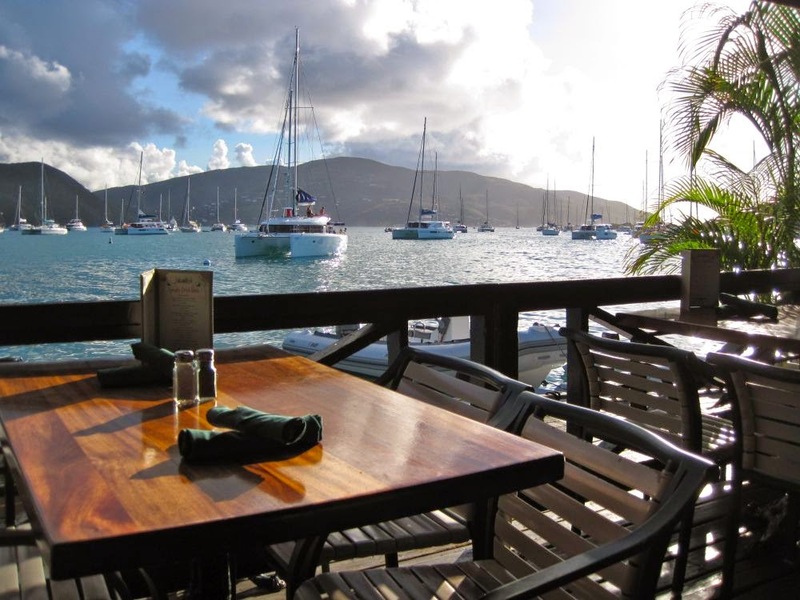 The Crow's Nest bar in the marina was a meeting place for many of our fellow cruisers. Friendships were renewed among a lot of the ARC fleet with crews we had sailed with arriving daily from other islands in the Caribbean. 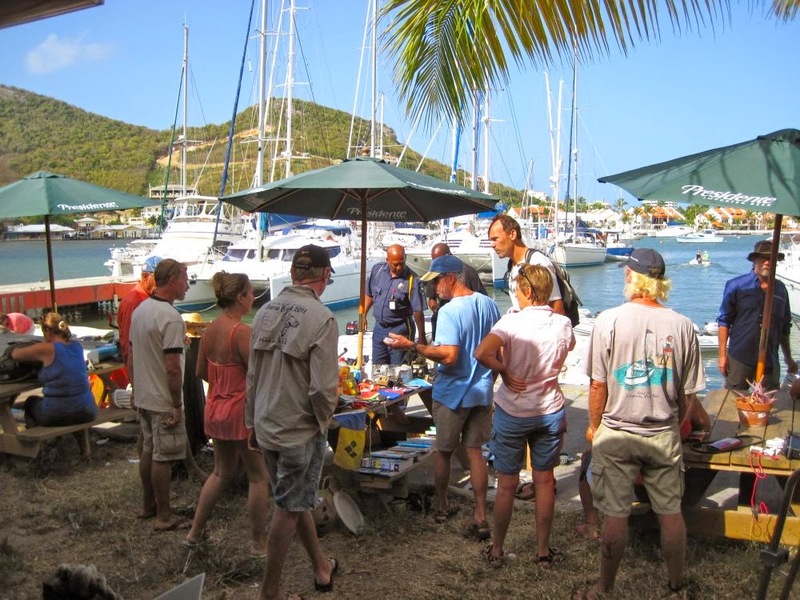 It was like a home coming as we sailors converged in Antigua. 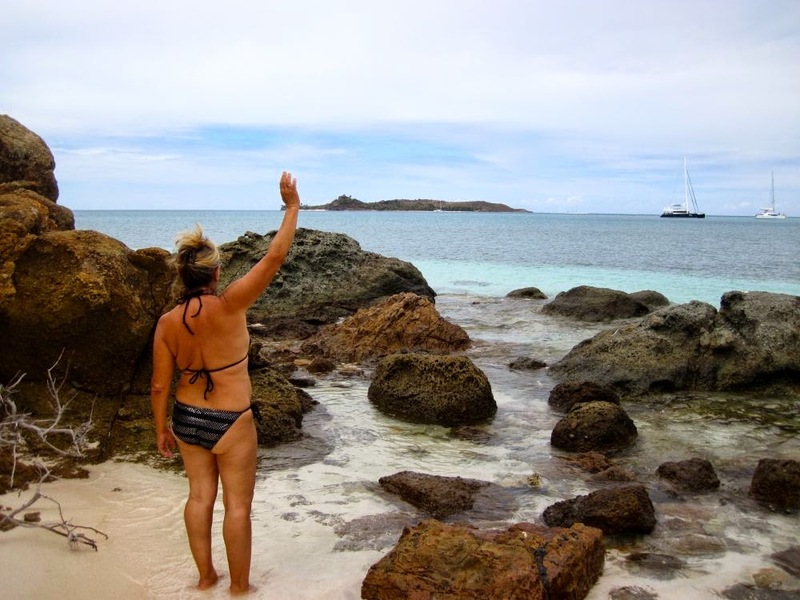 St. Patricks' Day on Sint Maarten was looming on the horizon so after a couple of weeks we had a fantastic sail to one of our favorite islands in the Caribbean. 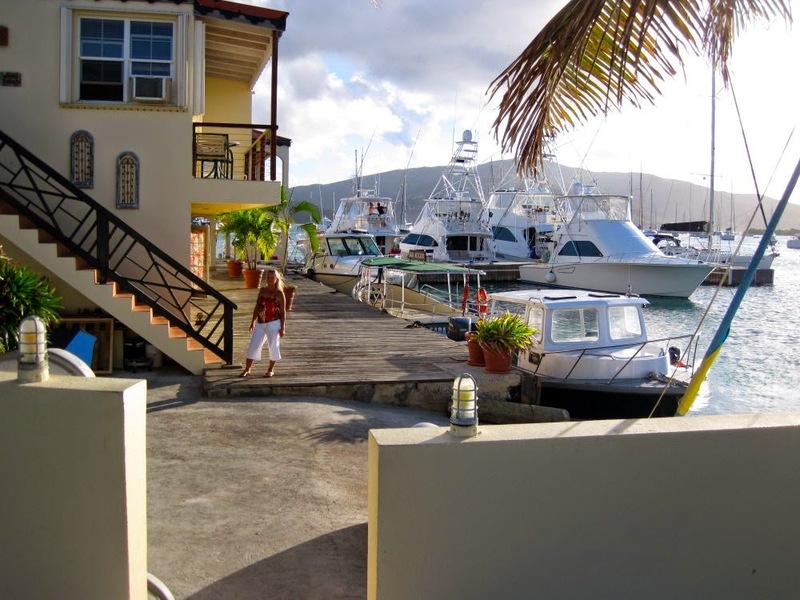 After an overnight sail, daybreak found us waiting for the opening of the drawbridge into Simpson Bay Lagoon on the Dutch side of Sint Maarten. 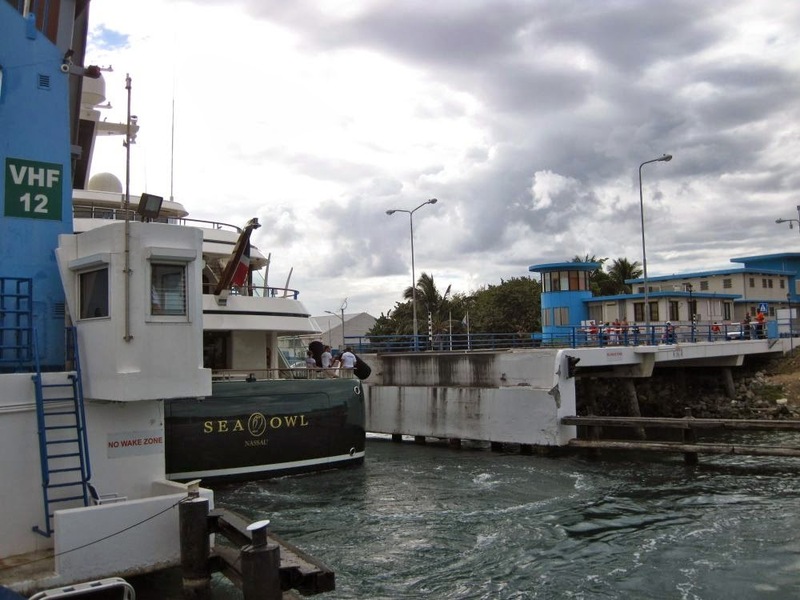 Without much delay the bridge opened and we motored into the peaceful lagoon, but guess what? Our reverse gear decided not to work at that point! Ok, so we had to go into a slip in the marina without reverse. Geeze. Luckily there were 3 dock guys waiting to catch our lines and stop our forward progress before Aspen crushed half of the concrete dock with her bow! So here we are, waiting for a part to be made in jolly ole England to fix our reverse gear lever before we can continue on. They say it will be 2 weeks to make the part and then it will be sent to us. Time will tell and we really hope they can tell time!